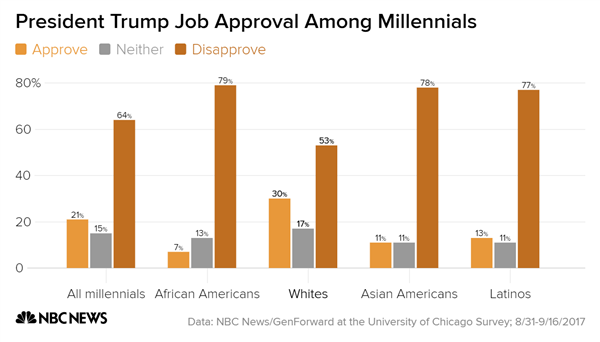 Millennials overwhelmingly disapprove of the way President Donald Trump is handling his job and they don't have a favorable view of the Republican Party. But Democrats shouldn't celebrate just yet, according to results from the first NBC News/GenForward Survey. A majority of millennials, 64 percent, disapprove of Trump's job performance, while 58 percent said they have an unfavorable view of the Republican Party. The survey was conducted Aug. 31-Sept. 16 among a nationally representative sample of 1,816 adults aged 18-34. Historically, the party of the president loses seats in midterm elections, and the Democrats have high hopes for 2018. But any significant gains will require that the party's core voting blocs are energized and mobilized to vote. Millennials are a critical group for Democrats, and although they feel warmer toward the party than they do the GOP, they don’t feel overwhelmingly positive about either party. Just 43 percent of millennials have a favorable view of the Democratic Party, and only a slight majority (53 percent) said the party cares about people like them. Similarly, millennials were more likely to say the Democratic Party cares about people like them than the Republican Party does. Only three in 10 millennials said the Republican Party cares about people like them. Still, nearly half (46 percent) of millennials said they don’t think the Democratic Party cares about them. In other words, millennials aren’t fully convinced that either party best represents their interests. Political uncertainty among millennials is also clear in terms of 2018 congressional election preference — 41 percent of all millennials said they’re not sure if they will vote Democratic or Republican in the midterms next year. Another 37 percent said they plan to vote for the Democrat, and only 21 percent said they plan to vote for the Republican. Race is another important demographic in American politics, and taking a look at racial subgroups among millennials helps understand support for the two parties. When breaking down attitudes about the Democratic Party by race, it is clear that African-American, Asian-American and Latino millennials are driving Democratic warmth: At least half of the respondents in each of those subgroups had a favorable view of the Democratic Party. 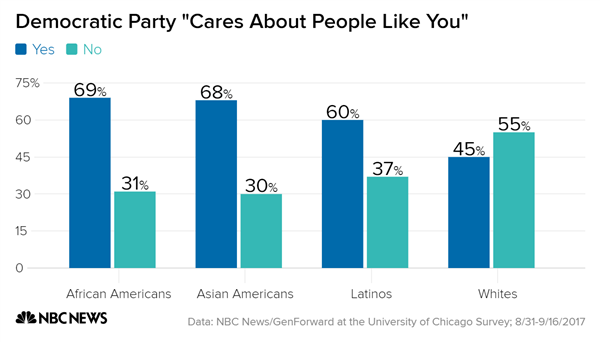 However, a sizable number of African-American (31 percent), Asian-American (30 percent), and Latino (37 percent) millennials said that the Democratic Party does not care about people like them. This is not an insignificant portion of any racial group, and it points to signs that the Democrats have not convinced millennials that the party best represents their interests. White millennials are the only racial subgroup that is more likely to say the Democratic Party does not care about people like them (55 percent) than cares (45 percent). White millennials are also the only racial subgroup to hold a more unfavorable view of the party (54 percent) than favorable (33 percent). Tepid feelings toward the Democratic Party among white millennials aren’t necessarily a good sign for the Republican Party, however. A majority of white millennials hold unfavorable views of both the Democratic Party (54 percent) and the Republican Party (53 percent). Similarly, neither party has convinced a majority of white millennials that their policies are sufficiently concerned with people like them — 60 percent of white millennials said the GOP doesn’t care about people like them, and 55 percent said the Democratic Party doesn’t care about people like them. 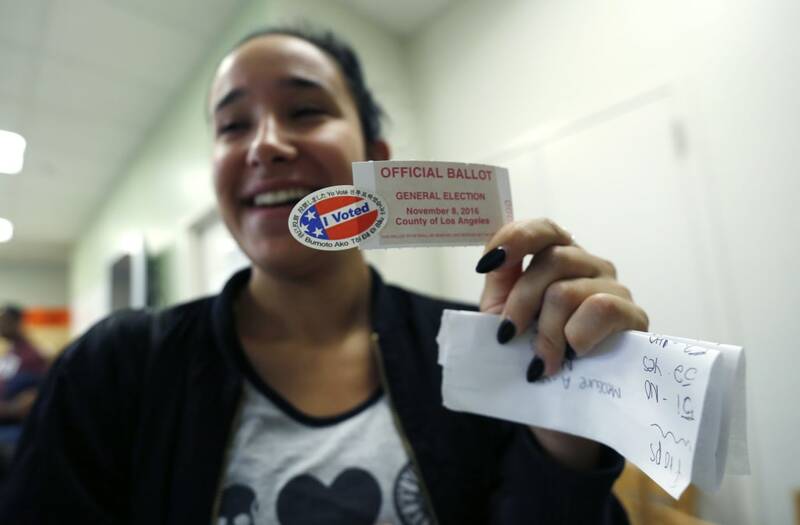 Overall, a third of millennials (33 percent) said that neither party cares about people like them — a significant portion of young adults when considering the growth of the millennial electorate. This group of disaffected adults are mostly men (57 percent, to 40 percent women); evenly distributed across party lines (32 percent Democrat, 33 percent independent and 34 percent Republican); and mostly white (61 percent, with 19 percent Latino, 13 percent African-American and 5 percent Asian-American). Their education level also varies: Thirty-nine percent don’t have college degrees, 38 percent have some college, and 23 percent have a bachelor's degree or higher. The NBC News/GenForward at the University of Chicago Survey was conducted Aug. 31-Sept. 16, 2017, among a nationally representative sample of 1,816 adults ages 18-34, recruited and administered by NORC at the University of Chicago. The overall margin of sampling error is +/- 3.8 percentage points. For full results and methodology, click here.